"I'll believe it when I see it!" That has been my answer to any and all redevelopment plans put forward over the years to restore the Winecoff Hotel. After all, there have been so many of them and yet the strategically placed building just sits and sits. Generation after generation of pigeons have roosted inside the structure flitting in and out through broken windows. Neglected for so long, the building that towers fifteen stories above the highest piece of ground in downtown Atlanta, has become virtually invisible to most Atlantans. Amazing! Now comes the latest effort to revive the building. The new developers have at least shown that they can put on a show. The 10 am "groundbreaking" ceremony held April 21st offered new hope that the old hotel will again be put to good use. Held beneath a portable white tent on the tiny space owned by MARTA next to the building, speaker after speaker extolled the virtues of the new plan. It all sounded surprisingly credible. Atlanta firefighters guarded the event as if to silently give their blessing to the new plan. Each one of them knows well the story of what happened there in 1946 and in turn they looked at the building and paused, no doubt thinking, "it could have been me, it could still happen to me." TV reporters scrambled to get a quick education about the history of the building and the new plan for their live shots at noon. Like so many, they had driven by the building dozens of times and hardly noticed it. Only WSB radio reporter Sandra Parrish had come prepared. A troop of loud protesters could be overheard through parts of the ceremony chanting, "Stop mortgage fraud." They had come at the behest of Courtney Dillard, the last in a long string of would-be redevelopers who have seen their dreams dashed, their money vanish. The sun shown brightly and when the speakers had had their say the crowd was invited inside to the area that was once the hotel's lobby. There the "groundbreaking" took place. Actually, a dozen or so silver hammers were handed out to those who are involved with the new plan and on the count of three they all took a few smacks at a piece of dry wall, knocked a few holes in it then left it standing and damaged like the rest of the hotel. How dreary the old lobby looked, long overdue for a face lift. The only means of orientation for students of the Winecoff fire were the elevator doors and the structural pillars. 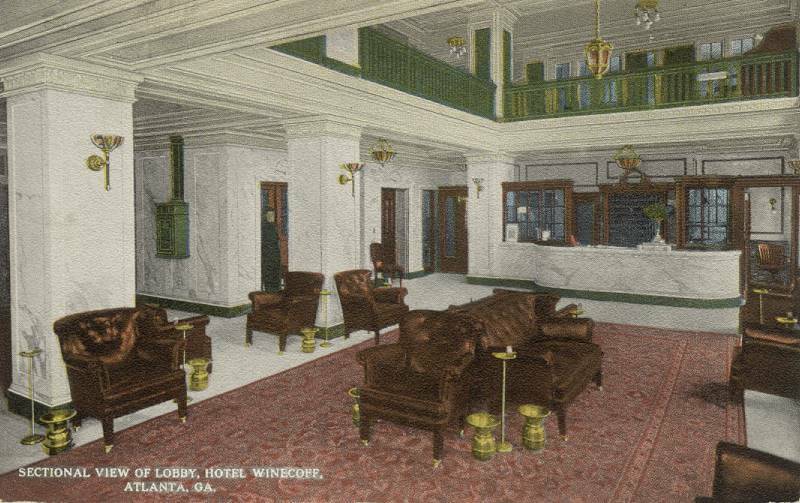 When the crowd had drifted away and the TV reporters moved across Peachtree St. so their cameras could glimpse the enormous "invisible" structure, down the stairs, a little short of breath, came a real life connection to The Winecoff fire: Janet Cox - daughter of survivor Dorothy Moen Cox. I looked at her and in an instant I knew where she had been, room 730. "Did you visit Mama's room?" I asked. "I saw Mama's room," she replied. We all live for days worth remembering. Long after everyone at the ceremony has forgotten it. Whether the new plan succeeds or fails the day's most poignant and memorable moment will be, of course, the one attached to the Winecoff fire. Hear WSB Radio's reports by Sandra Parrish. I read your book on the Winecoff fire when it first came out and have wondered how to get in touch with you ever since. I was present on the street on that terrible night. I had been to a high school dance and afterward had driven downtown to meet some friends at an all-night restaurant for a late night breakfast. On my way home, as I drove up the street beside the hotel, I heard horrifying screams coming from the alley behind the hotel. A small crowd was gathering and I parked the car to see what was happening. At that moment I heard the sirens of the approaching fire trucks. As the firefighters were getting organized it became apparent that they did not have the manpower to handle the nets and they asked for volunteers from bystanders. I was one who did volunteer and was there throughout the night and even assisted in carrying out bodies the next morning. At sixty years removed my recollections are just a confused blur highlighted by a few snapshot memories. I cannot reconstruct a time line of where I was or how long I spent in any given activity or how much as just a spectator. I did identify several incidents in which I was actively involved, particularly the net jump of the man I now know was named Alvin Millman. I don't know how many men are supposed to man those nets but I do know we didn't have enough. The net did break Mr. Millman's fall but he hit the ground pretty hard. I was surprised and gratified that he got up and walked away apparently uninjured. From my recollection your account of the events on the street was stunningly accurate, so much so that I almost wished I had not read your book. I found it most unsettling as you can imagine. Reliving the events of that awful night is something that I approach reluctantly. As an eight year old child I was rescued from a house fire by a neighbor who caught me as I jumped from a second story window. That fire took the lives of my mother and my younger brother. I do believe that was the cause of my eagerness to give assistance when asked and of my staying through the night. I believe it also contributed to the deep depression that enveloped me for several days following the Winecoff tragedy. But, thanks be, the seventeen year old psyche is resilient. 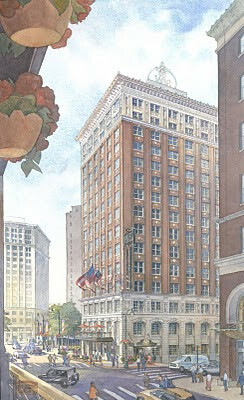 A groundbreaking ceremony is announced for the reopening of the former Winecoff Hotel at 176 Peachtree, with the new name to be unveiled at the groundbreaking. The long-awaited redevelopment of this property will return the building to its former glory as a luxury boutique hotel, enhanced by state-of-the art technology and design. The developer, Kelco/FB Winecoff LLC, has enlisted Boykin Management Company, a leading hotel management company specializing in independent and boutique properties across the U.S., to oversee the day-to-day operations of the 127-room hotel. We invite you to attend this long-awaited groundbreaking ceremony for this catalytic project in the heart of Atlanta's Central Business District on April 21 st at 10:00 am. The hotel will also get a new name, to be unveiled during this ceremony.